US Vice President Mike Pence's repeated threats toward North Korea are nothing more than a bluff, Russian academic Georgiy Toloray suggested in an interview with Radio Sputnik. According to Toloray, this bluff is aimed at making China increase its pressure on Pyongyang. In an apparent attempt to raise the stakes for North Korea, US Vice President Mike Pence warned Pyongyang on Monday against "testing" the resolve of US President Donald Trump. "Just in the past two weeks, the world witnessed the strength and resolve of our new president in actions taken in Syria and Afghanistan. 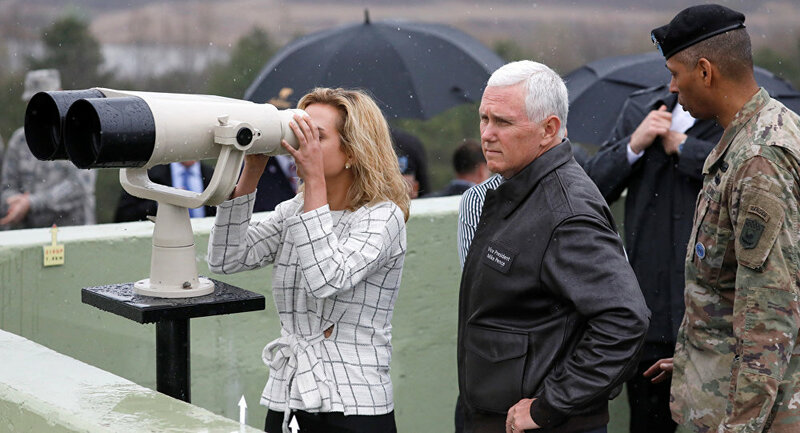 North Korea would do well not to test his resolve or the strength of the armed forces of the United States in this region," Pence said in a joint appearance with South Korean acting president Hwang. Earlier in the day Pence highlighted that "the era of strategic patience [toward North Korea] is over." The statement came in response to Pyongyang's failed missile launch on Sunday. For its part, Moscow urged all sides to show restraint, avoid provocations and coordinate common efforts to settle the issue of North Korea's nuclear weapons program. "We consistently urge all parties to show restraint in this situation, we call on everyone to avoid any actions that could be regarded as provocation," Kremlin spokesman Dmitry Peskov told journalists Monday. Speaking to Radio Sputnik, Georgiy Toloray, the head of Korean studies at the Institute of Economics of the Russian Academy of Sciences, expressed his confidence that Pence's tough stance "is mere rhetoric." "The 'era of strategic patience' was announced by [former] President Barack Obama," Toloray recalled, "the US waited patiently for the North Korean regime to disintegrate by itself, trying to facilitate the process through isolation [of the country], sanctions and pressure." "Now Donald Trump and his administration say that it is necessary to act decisively and take measures against the DPRK, including military options. However, in my opinion this is still a bluff. And this bluff is aimed primarily at making China act more decisively towards North Korea," the Russian academic said. Toloray believes that Washington is unlikely to use force against Pyongyang in the near future. "[US] aircraft carriers have been once again dispatched to [the Korean Peninsula] to emphasize [Washington's] importance in the world. But I still do not think that a military conflict is really in the [White House's] plans, since it would have the most destructive consequences not only for South Korea and Japan, but also for the US itself, including their servicemen. 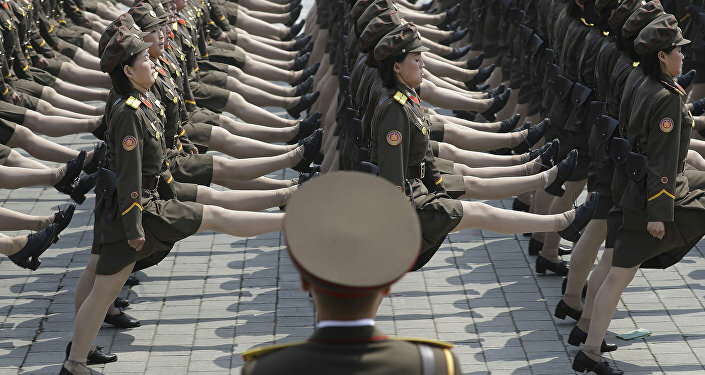 North Koreans have something to retaliate with even without nuclear weapons," Toloray remarked. Igor Korotchenko, a Russian military expert and editor of "National Defense" magazine, shares a similar stance. "It is possible that Kim Jong Un has a special team, the goal and the task of which is to retaliate in the event of an aggression against North Korea. For example, it is possible that one or two nuclear warheads could be loaded on a submarine and then this sub will head either toward the coast of South Korea, the United States or to the Japanese coast, where nuclear action can be carried out. It is a terrible scenario, all this puts the world on the brink of World War III," Korotchenko told Radio Sputnik on Sunday. Last week Trump vowed to "take care of" the North Korean "problem." For its part, Pyongyang pledged to launch a "preemptive strike" in the event of any "US provocation," at US bases in South Korea, Japan and the USS Carl Vinson.